The English shooting estates that rear 20 million pheasants a year – Who Owns England? This post is by Guy Shrubsole. Go for a drive down a country lane and you’re almost certain to encounter a pheasant, most likely as it leaps, kamikaze-style, into the path of the oncoming car. Pheasants are a non-native species in Britain, introduced for shooting; and though we tend to think of them as a harmless (if rather stupid) species, their numbers are now vast – a staggering 35 million are released in the UK every year (20 million of which are in England, as we’ll later see). A recent study showed the biomass of introduced pheasants outweighed the biomass of all wild bird species in the UK. So who’s releasing all these pheasants? What’s the ecological impact of doing so? And who owns some of the estates responsible? Who Owns England decided to investigate. To be clear from the outset: the science on pheasant releases is complex, and doesn’t cut all one way. Many pheasant shooting estates invest in planting cover crops for pheasants that also provide food for wild bird populations. Figures from the Game & Wildlife Conservation Trust (GWCT) suggest that shooting estates have planted thousands of acres of woodland copses and hedgerows for pheasants to shelter in – creating lots of space for other wildlife in the process. And there is increasing evidence that this weight of pheasant numbers is having negative ecological impacts – much of it gathered by the GWCT themselves: with high densities of pheasants shown to alter the structure of hedgerows, cause significant changes in invertebrate communities, and have long-term negative impacts on woodland species diversity and structure. This begs more questions: what’s this outsize population of pheasants doing to other parts of the food chain? What’s the impact been on predator populations? Is there any link between the vast increase in pheasant numbers since the late 1960s and the 56% decline in farmland birds observed since 1970? Part of the problem in answering such questions is the lack of granular data: we just haven’t known where the largest releases of pheasants have been taking place, and which estates are likely doing so. Until now, that is. Pheasants have a truly bizarre legal status: when they’re reared by estates, they’re classed as livestock; when they’re released for shooting, they magically become wild birds. Pheasants’ classification as livestock grants shooting estates some tax benefits and exempts them from certain planning controls; but it also means they must register the number of pheasants they are rearing with the government. But how to get at this more detailed data? In 2014, AHVLA became the Animal and Plant Health Authority (APHA). I decided to submit a Freedom of Information request to APHA requesting the total number of pheasants reared in England in 2018, broken down by local authority area and by postcode district. At first, they refused to disclose the more detailed postcode district data, but released county-level pheasant numbers, which you can view in this Google Sheet here. APHA eventually released to me data on the number of pheasants in England broken down by postcode district. Here’s their FOI response, and the data in PDF format; and here’s the dataset, slightly cleaned up, in a Google Spreadsheet. One postcode district, YO61 in North Yorks, contains over a million pheasants! There are 11 postcode districts containing over 200,000 pheasants each. These top 11 postcode districts account for 3.6 million pheasants, spread over just 149 premises / shooting estates. In other words – there is a high concentration of pheasants in a small number of areas, and over a small number of estates. Attribution: Copyright © 2015 by OpenDoorLogistics (www.opendoorlogistics.com). Contains Royal Mail data © Royal Mail copyright and database right 2015. Contains National Statistics data © Crown copyright and database right 2015. Armed with this data on where the highest concentrations of pheasants are makes it a lot easier to start tracking down large shooting estates. I’ll focus here on examples of estates I’ve identified in two clusters: 1) North Yorkshire (postcodes YO61, YO62 and YO18); and 2) Devon around Exmoor (EX32 and nearby). 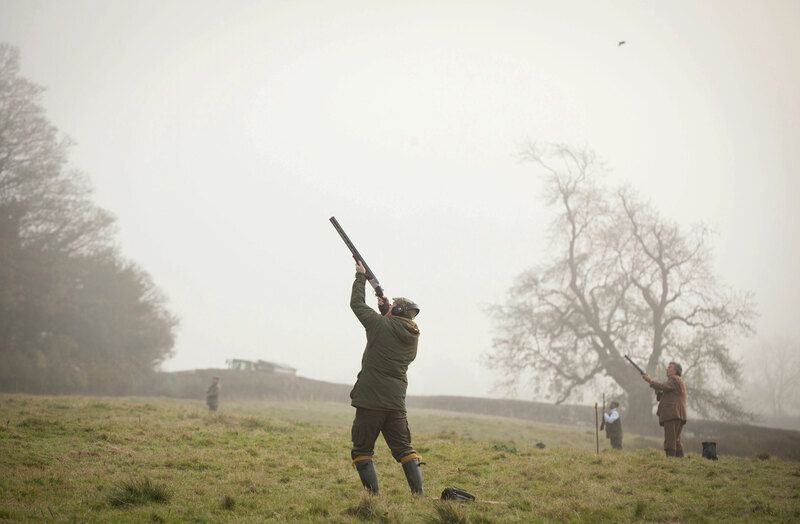 A pheasant shoot in progress at Newburgh Priory. Source. Other pheasant shoots in YO62 listed on GunsOnPegs include the Ravenswick Estate near Kirkbymoorside (which has an intriguing, chequered history: the stately home was recently demolished and a fresh one planned by a mysterious new owner); and the 5,000-acre Farndale shoot, further north onto the moors. It seems likely that some of the pheasant shoots in this part of the world belong to grouse moor-owning estates that dominate the North York Moors. For instance, the Spaunton Estate of Moorland Association committee member George Winn-Darley offers both grouse and pheasant shooting. And in the adjacent postcode district YO18 (home to 377,700 pheasants in 8 premises), the Westerdale and Rosedale Estate of Carphone Warehouse founder David Ross also operates both grouse and pheasant shoots. EX32, on the edge of Exmoor in Devon, contains 280,750 pheasants over 9 premises. Within this postcode district lies the Castle Hill Estate, owned by the Fortescue Farm Partnership (they show up in the Section 31 declarations layer on our Who Owns England map). There’s nothing on their website to immediately suggest they’re a pheasant shoot; but GunsOnPegs has an entry for the ‘Temple Shoot’, which advertises itself as taking place on the Castle Hill Estate in North Devon. The estate appears to belong to Lady Laura Duckworth-Chad, daughter of the Countess of Arran and Conservative Peer the Earl of Arran. So, whilst many pheasant shoots appear to be run by smaller farms and businesses, at least some of the larger shoots are owned by the aristocracy. That suggests the APHA pheasant dataset is a good, but not perfect, guide to where the highest densities of pheasants are in England. Clearly more research is needed into who owns the largest pheasant estates, and what ecological impacts they’re having on the surrounding environment; but meanwhile, the numbers of pheasants rise and rise. A somewhat younger Michael Gove on a pheasant shoot. Source. The Badgworthy Land Company does not own land per se but owns the Sporting Rights. Heya! Thanks for this – my understanding from Land Registry records is that Badgworthy do also have freehold ownership of a considerable acreage – they show up in the Corporate & Commercial dataset (which is meant to only record freehold rights) as owners of 12,500 acres. The person to ask is Hugh Thomas. I only know people who have given the BLC the sporting rights to their property. This was primarily aimed at preventing incomers from stopping hunts from crossing their land. – YO61/2 area – Rievaulx Sporting & Mount St John Sporting (postcode out of area), and many others. – British Trust for Ornithology (BTO) have been researching whether more released pheasants leads to more generalist avian predators, which may impact other species, but I don't know if their bird rearing dataset was as detailed as yours. Must confess, I had naively thought pheasant shooting was a leftover relic of the Victorian era and bound to die out eventually – seems I couldn’t have been more wrong! I really don’t know what to think. I just cooked pheasant, from breasts bought from a small independent butcher in a small shop in a small village in mid-Wales, thinking about a food system of small players and traditional game as an alternative to industrial meats. ( I made a lovely stir-fry with nettles and wild garlic, Chinese flavours. ) Yet, if you read this article, you’ll understand all the many issues surrounding these birds, related to general bird biomass, ecology, land ownership, and food supply. It’s chilling that this explosion of pheasant numbers, many more than can be eaten in this market, takes place at the same time as some people pushing for more industrial chicken sheds in the countryside: raising livestock birds for cheap meat, raising wild birds for the pleasure of the hunt and who compete with local birds in waning populations. You can’t drive around here in spring without seeing dead pheasants all over the road. Why did the pheasant cross the road? To make us aware of all these conundra. Regarding pheasant shoots in the North York Moors, I’m pretty sure the Hawnby and Arden estate includes pheasant shooting along with grouse moor, and there’s another one nearby, Murton Grange. Then there’s Duncombe Park closer to Helmsley, and Pennyholme not far from Kirkbymoorside, towards Bransdale I think. No doubt there’ll be others. You mention the Westerdale and Rosedale estate. That estate crosses several different postcode areas. I know one area of that estate where most of the release pens seem to be, so it would be interesting to know where their birds are actually registered to. not sure if you have combined the game farms that are producing birds for other shoots, top news story on innocentbadger dot com (pheasant farm breeding stock liberated) also about 40% of birds are imported from France as day old chicks, apha can be very disingenuous about the true figures. Back in 2013 the data set with the heat map showed that 50 million game birds were present on Jan 1st 2013. Well done with this, good work.